Who are the 24 elders? The popular Christian interpretation says that the 24 elders represent the raptured Church. But is that figurative reading backed up by literal Scripture? Why not just take the passage as it is plainly written? There really can be 24 elders in Heaven if you understand where they came from in an overlooked passage in connection with the day of Jesus' death. In the process, you will learn something about the three planned mass resurrections of the righteous. Hello, I am a disciple of Christ who has been studying prophecy for about the last ten years. 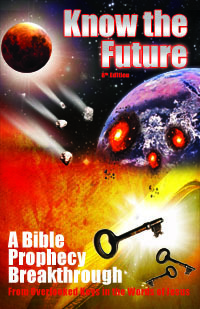 I was taught all my life that there was a pre-tribulation rapture. However after years of study I now have a problem with this doctrine, it does not seem to fit the end time scenario. I have one question that I have never heard addressed that is puzzling me. If there is no pre-trib rapture then who is the multicultural group of persons in Revelation 5:9-10 [the 24 elders]. This group in their song of praise says that they have been redeemed by the blood of the Lamb and are present in heaven before the seals are opened. Who the 24 elders are is a question a lot of people have wondered, including me. I think I finally came to the most reasonable scriptural answer to the question a few years ago, only after rejecting the popular notion that 24 is not a literal number. This question exists whether you believe in a pretrib rapture or not. 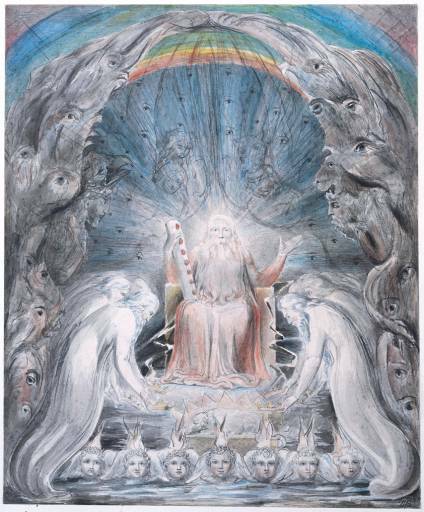 John is seeing the 24 elders and four creatures in Heaven in his time. There's nothing indicating that it is a future scene. It's simply the throne room in Heaven. Later we do get a scene of the same throne room in the future (Rev 15), but this time with many souls standing on it singing the song of Moses and the song of the lamb. That would indeed take place only after the rapture, or gathering of the firstfruits to Heaven. It happens after the 7th trumpet (Rev 11:15) and the seven bowl angels are seen parading out to deliver their deadly payload (Rev 15:1-6). So how did the 24 elders get there back in the first century sometime after Jesus death when John received the apocalyptic vision? First, let's make sure we know what we're talking about. Who are these elders: men or angels? 24 Elders Men, Not 24 "Elder Angels"
Revelation 4:4 — And round about the throne were four and twenty thrones: and upon the thrones I saw four and twenty elders sitting, clothed in white raiment; and they had on their heads crowns of gold. Here's why I feel these cannot be angels but must be men as it seems (although glorified men). It says they are elders — I cannot find the word ever applied to angels. This makes sense since angels don't age and probably are all the same age anyway, created together in the beginning. They sit on thrones and wear crowns — Again, you never will find an angel wearing a crown or destined to rule as the thrones imply. On the other hand, we are told throughout the Bible that the righteous shall inherit and rule the earth (Rev 2:26-27; 3:21; 5:10; 20:4; Mt 19:28; 1Co 6:2-3; 2Tim 2:12), including the twelve apostles sitting on twelve thrones ruling each of the twelve tribes (Luke 22:30). White Raiment — If they are righteous glorified men in Heaven, this is what they ought to be wearing according to Revelation 19:8 as the clothing of the Bride of Christ at the Marriage Supper will be, in addition to many parables of Jesus. Crowns — Angels never wear crowns in Scripture, nor are they promised them. Believers are promised crowns (Rev 2:10; 1Co 9:25; 2Ti 4:8; Jas 1:12; 1Pt 5:4). Is the Number 24 Literal or Symbolic? We've established that the elders are men. But are they really 24 men or is 24 representative somehow of all of the righteous who had died up to this point and taken up to heaven? Is it plain and literal or symbolic and figurative? Daniel 12:13 As for you, go your way till the end. You will rest, and then at the end of the days you will rise to receive your allotted inheritance. 1 Corinthians 15:22-24 — 22 For as in Adam all die, even so in Messiah shall all be made alive. 23 But every man in his own order: Messiah the firstfruits; afterward they that are Messiah's at his coming. 24 Then cometh the end, when he shall have delivered up the kingdom to God, even the Father; when he shall have put down all rule and all authority and power. Notice that there is the obvious resurrection/rapture of the righteous at Messiah's coming that all of us today hope to be part of. After that is another at "the end" when all the rest after the Millennium get their chance at eternal life, also called the Great White Throne Judgment (Rev 20:11-15). However, what we often gloss over is the fact that at Messiah's resurrection there were also "firstfruits" plural being resurrected, according to Paul. Where is this obscure event? Leviticus 23:10-11 — 10 "Speak to the Israelites and say to them: 'When you enter the land I am going to give you and you reap its harvest, bring to the priest a sheaf of the first grain you harvest. 11 He is to wave the sheaf before the LORD so it will be accepted on your behalf; the priest is to wave it on the day after the Sabbath. Matthew 27:50-53 —50 Jesus, when he had cried again with a loud voice, yielded up the ghost. 51 And, behold, the veil of the temple was rent in twain from the top to the bottom; and the earth did quake, and the rocks rent; 52 And the graves were opened; and many bodies of the saints which slept arose, 53 And came out of the graves after his resurrection, and went into the holy city, and appeared unto many. Notice that although the graves were opened at the moment that the earthquake of Jesus's death happened. The inhabitants did not wake up from their "sleep" (the same "rest" that Daniel still is in) and emerge until after Jesus' resurrection. As it happens, in Jewish tradition, the wave sheaf was first marked on Passover before it was cut and waved on firstfruits. Therefore, if all those who had their graves marked were then resurrected with Jesus on the same day, then it would perfectly fulfill the Torah "mikra"/rehearsals as they were performed. Why 24? Not Because "12 Tribes and 12 Apostles"
I added this section to explain the reason for the number of 24 after I saw several speculate on it in the comments. The common Christian thought is that "24 elders because there are 12 tribes of Israel and 12 apostles." But this misses that the reason for the 12 apostles itself is because of the 12 tribes that the 12 apostles will rule over (Mt 19:28). By this logic you could argue there need to be 36 elders not 24, because we have the 12 tribes, 12 apostles, and 12 gates of the New Jerusalem (which of course comes from the 12 tribes). No wait, it's 48... Let's not forget the 12 precious stones for the foundation of New Jerusalem (Rev 21:19-20). No doubt you can see how arbitrary it all is. Let's reset. Is there a 24 earlier in the Bible that the 24 elders can be based on without subjectively inventing combinations of Biblical twelves to roll your own 24? Yes, there is. In the Old Testament, David arranged the priesthood into 24 courses that covered temple worship services throughout the year. He chose to use 24 heads from the two priestly families descended from Eleazar and Ithamar, the only two sons of Aaron who had children. They were assigned by lot to 24 priestly courses (1Chr 24:1-19). Likewise, there were 24 divisions for the singers at the temple (1Chr 25). So you see, the number 24 comes from a precedent for organized human worship of Yehovah God. To have 24 elder men found in the throne room worshiping God makes sense given this precedent. Also, we know it has nothing to do with 12 apostles because they were not all dead and in heaven at the time of writing of Revelation. John the Apostle was still alive when he saw the 24 elders =). "What about 'No man has ascended to heaven except the Son of Man' - John 3:13? John was written after Matthew description of the graves opening..."
I don't know why it matters when John or Matthew were written. John 3:13 is a direct quote from Jesus' conversation with Nicodemus around 28-30 AD before his death and resurrection with "the firstfruits" (1Co 15:23). I'll grant that it's oddly worded in the past tense "ascended" making it unclear what Jesus is referring to since he seemed at that point to only have descended from Heaven and not yet ascended. But we don't know everything about his life or what he originally said in Hebrew. So I have learned not to get led into false conclusions based on grammatical arguments from the Greek NT translation. Moreover, there are other statements by Jesus that have odd, perhaps "prophetic," tenses like this. For example, "I saw Satan fall from Heaven" (Luke 10:18). The fall of Satan from Heaven seems to be described at the start of the Great Tribulation in Revelation 9, so what did Jesus see? A past event or a prophetic vision of the future? Another example is where he tells the first century disciples that they will "not finish going throughout the cities of Israel before the Son of Man returns" (Mt 10:23). They all died 1900 years ago, long before his return was even near or possible (given the prerequisites), so it seems like a silly statement to tell them unless it was prophetic about their end time successors, the 144,000. Revelation 20:5 states "... This is the first resurrection" referring the resurrection of the saints upon Christ's return. Yes, it does say that, "the first." The fact remains that Matthew records another resurrection of "many saints" before that. How do we resolve this apparent contradiction? I think the saints resurrection in Matthew was a special, limited resurrection that was never open to the general righteous/dead in Christ. For this reason it does not count. It is not a general-audience, mass resurrection that anyone else can qualify for. It's a special one off, just like the resurrection of Lazarus or the resurrection of the man whose corpse touched the bones of Elisha and came to life. This "first" counting being applied to the resurrection at Jesus' return actually supports the concept that the resurrection at Jesus' death in Matthew was limited to a small number such as those who became the 24 elders. The overlooked resurrection of a few saints provides for us a reasonable answer to who the 24 elders in Heaven are and where they came from. They are the glorified saints who were raised in the "first of the firstfruits" resurrection of the Messiah. It also explains what Paul was talking about when he described a resurrection of people with Christ. It's the best answer I have seen to the 24 elders taking everything literally and tying in obscure passages. To continue learning on all the resurrections in God's plan and their importance, see my article on the Three Resurrections. But they appear before any human are you telling me that only 24 graves were open? That’s illogical thinking cause we got Adam Seth Enoch Noah Methuselah Abraham Shem Issac Israel the 12 tribes Moses Arron Joshua, that’s 24 wouldn’t some kings and prophets and priest be missing? Yahtzaphan, I don’t know how many graves were opened; it does not say. If they were the source of the 24 elders as I believe, then 24 makes sense. But your objection to 24 indicates to me you think this was the first resurrection for all the righteous that you made a brief list of. It is not. This is the “Christ the Firstfruits” resurrection, nothing more. The big resurrection of Enoch and everyone else righteous will come later as my other article explains. When the graves were open they came out of their tombs, no where in the scriptures does it say that these individuals ascended into heaven in glorified bodies. They all went into the holy city and appeared to many. Just like Lazarus who was raised from the dead and lived until he died again. Jesus went and was seen by over 500 people at different times over 40 days. Jesus went to the Father first and presented himself as the First Fruits of the Harvest and then came back for 40 days to prove to those who knew and believed him, that He had risen from the dead. The other individuals who came out of the tomb after His resurrection went straight into the city so they could be seen by people who had know them while they were alive. This would have been another testimony for Jesus as the Messiah. If the Apostles didn’t believe he had risen until they had seen him, how much important would have it been for others to see? They didn’t travel with Jesus for 3 years and eat and sleep with Him. It is my opinion that the 24 represents the Church, who is the bride of Christ. We will be Kings and Priest, reigning with Jesus on thrones at His right hand. The Priestly number is 24 and that is why we have 24 Elders. They represent the whole church which is the body of Christ. Two (2) become one when you are married. They had crowns, thrones, and white raiment. All of which is outlined in the letters to the 7 Churches. This is the Churches reward. Now, the Church is mentioned 19 times in Chapters 1-3 but never again until chapter 19 when Jesus returns to earth with all His Saints and Angels (Armies of Heaven). Jude verse 14, Zechariah 14:5, and 1 Thessalonians 3:13 all back this idea. How do we come back with Jesus if we are not already in Heaven with our glorified bodies? Bride, it does not say they did not ascend to heaven =). Somebody was part of “Christ, the firstfruits” that Paul refers to in 1Cor 15:23. If it was not the those raised when Jesus was raised then who was it? David, interesting, except all of the 12 apostles (like John!) were still alive at the last resurrection that could have got them into heaven by the 90AD writing of Revelation when they are seen in Heaven by John. When you die you don’t walk around heaven unless a resurrection has happened, as happened when Jesus died in 30AD, the graves were opened and many (24?) saints came to life (Mt 27:52). I agree with you, these were the first fruits who were raised with Christ, ….. they didn’t have to be prominent people from the Bible either as the commentor above suggests, just random righteous believers who were chosen at random perhaps. I have a question about the last scripture you posted: Matthew 27:50-53-50 Y’shua, when he had cried again with a loud voice, yielded up the ghost. Tamida, the opening of the graves served to mark them as first fruits. Just as the firstfruit grain was marked first before being harvested and waved. The saints may have risen when Jesus rose, there is some verse saying this. But I got this from Michael Rood and don’t know the verse exactly. It’s tied to the firstfruits ritual the Jews kept. I wish I had more documentation for you. the Bible says in revelation 5 vs 8–10 now when He had taken the scroll, the 4 living creatures and the 24 elders fell down before the Lamb,each having a harp and golden bowls full of incense,which are prayer of the saints. vers 9 And they sang a new song, saying you are worthy to take the scroll and open its seals:for you were slain and have redeemed US to God by your blood out of every tribe,and tongue and people and nations. vers 10, And have made us kings and priest to our God. and we shall reign on the earth. =where the 4 living creatures redeemed from earth? The English word “SLEEP” means “dead” not dozing and dreaming, in biblical terms . It is a transliteration of the Greek word “koimao” (Strong’s concordance G2837) ,which means deceased or dead. So that verse reads -and the graves were opened ;and many bodies of the saints which were dead,Arose. What about Lazarous and the fact that Jesus took them out of the place where they were separated from the ones in hell? The spirit leaves the body to be with Jesus and the body is risen when Jesus returns for his church. Sybil, Lazarus and the Rich Man was a parable based on prevailing Egyptian notions of the afterlife, much like our common American/Christian “Peter at the Pearly Gates of Heaven” trope is used in many stories to teach, usually, just one salient point, without any attempt to be eschatologically accurate. As for our spirit going to heaven where Jesus is when we die: True, we do ascend and are found there (Rev 6:9), but as the revelation of prophecy tells us plainly, we are not conscious even if we were a blessed martyr (Rev 6:9), but are “resting a little while longer” (Rev 6:10-11) until the rapture and first resurrection come (Rev 15:2-3 = Rev 20:5). There is no point to the resurrection, a foundational teaching of the NT, if we just go to flit around with Jesus immediately upon death. Exactly Brian. That’s why i believe 12 of those elders are the 12 tribes of Israel. As for significance of the number 24. What we do know is 12 is a ‘starter number’ per government. Since every matter must be judged by 2 or 3 witnesses, my guess is 12 are pre-Church and 12 are Church age. Revelation 20:5 states “… This is the first resurrection.” Referring the the resurrection of the saints upon Christ’s return. Your interpretation of it would mean that we shouldn’t take the term “first” in this case literally. Do you think that’s a reasonable way of interpreting it? Maybe you had addressed this but I missed something your article. Brian, great comment/question, now addressed in the article for completeness. John 3:13 which was written much later says: 13 And no man hath ascended up to heaven, but he that came down from heaven, even the Son of man which is in heaven. So what is your explanation of this? Larry I’ve added a section for John 3:13 in the article above. Yes ,no man (human flesh and blood body) has ascended up to heaven but he that descended from heaven. When Christ died ,according to scripture, he did not see corruption (body putrefaction by germs,bacteria, which decay the human body at death). His body was unaltered . He set the captives(father Abraham and the other elders of Hebrew 11, based in paradise,at the belly of the earth ,opposite hell) free. He rose from the dead and showed his disciples his flesh and blood body with the crucifixion marks on the palm and leg. He rose to heaven with this same flesh and blood body because he is GOD and can do such because he is GOD. Those 24 elders ,identified in Hebrews 11,by their names and heroic acts , went to heaven as living souls,whilst their dead flesh and blood bodies putrefied in their graves,as at the time they died during the generation of the OLD TESTAMENT. Christ, is known as the Son of Man ,meaning thehuman flesh and blood body MANIFESTATION (man) of GOD. The fact that these now living people went into the city and appeared to many would indicate that they were some who were recognized and who had recently died and been buried. None of the important figures of the past would be recognized by anyone even if they saw them alive. So what eventually happened to these “many bodies”? Only two possibilities. They went back into their graves and died again, or they were given spiritual bodies and became partakers of the reward of the saved, only in an earlier timeframe, predating the first resurrection. Gamma, Matthew does not say that those raised at Jesus’ death who went into the city were recently dead nor recognized. But if you have 24 of these folks coming up together in the graveyard at Jesus’ death, it would be obvious something else special happened at Jesus death, as a witness. Along with the earthquake, the veil splitting and a few other things the Talmud records. Sharon, I think that interpretation misses that there is only one church/body of Christ in the Bible: we the believers as a whole. “Church denominations” are an invention of man that came later and by definition are false since they are all religions that add to the word of God. The true worship of God is religion-free and tradition-free and based simply on doing what the word/will of God says (Lk 8:21): love God in faith by loving your neighbor as yourself (Mt 22:36-40). This sums up God’s will for man and when you put religious commands of denominations into the mix, I’ve only seen believers forget what’s important according to Jesus. Yes Tim I believe you are correct, They were resurrected and had to be given their translated bodies to be ascending to heaven shortly after Christ. They needed to be in place to fulfill scripture as it was shown to John. Remember when Yeshua was first resurrected Mary did not recognize Him, because now He was perfected. So also those 24 would not be recognized in their new bodies. Yeshua said we would be as He was. They also at this point were given total knowledge so yes they could give input and answers to John. Well you are in that they didn’t see death. To be more accurate they won’t suffer the 2nd death. 1) I’ve heard some argue there should be a comma after the word Christ in verse 23 which would mean there were 4 resurrections mentioned here (Christ, then the Firstfruits, then those resurrected at his coming, then those at the end of the Millennium). But verse 20 clearly states that Christ IS the Firstfruits, so the comma theory seems to be subjective and does not have a strong argument. 23 But every man in his own order: the firstfruits, Christ; afterward they that are Christ’s at his coming. For those reasons I have determined that the explanation for the 24 elders as those raised at Messiah’s death is incorrect. But I’m still studying and appreciate everyone’s feedback. Gary, 1) The comma matters not as there was no “first fruits” resurrection since Christ apart from the ones raised when he died as mentioned. Note also the “afterward” meaning some time later until the next resurrection: when he comes. The firstfruits had to be concurrent or before “afterward” and the 2nd coming. 2) Those raised in Mt 27:51-53 seem to have only been raised as flesh as no mention was made about them being glorified like Jesus, which would have been an amazing story like Jesus’ was passing through walls, etc. Thus, contrary to your conclusion, those raised at his death did not “beat him to the punch” as the first begotten son or violate anything; nothing was out of order. They went to heaven to be glorified by him after he was glorified first, the priest holding and waving the wave sheaf to heaven! If this is not the case then I don’t know who the 24 elders are since they are not angels and no one could have gone to heaven before Christ and there is no record of any resurrection since Christ apart from the one Matthew records at his death. But I understand this conclusion is not so obvious to all and it will remain one of the mysteries of the Kingdom for most like Jesus said (Mt 13:11). Through my studies this is the Divine Council spoken of throughout the OT. They aren’t angels per se. These are the remainder of the sons of God – the mighty ones – who didn’t sin. There is an enormous amount of Biblical support for this. Daniel, 1. Satan wants God’s throne which proves my point: angels including Satan don’t have their own throwns! 4. Calling an angel a “prince” does not automatically put a crown on his head. Show me one verse in the Bible where an angel is wearing a crown. Also, the word prince does not mean “son of a king” there but “chief” as in “Michael the archangel” as some translations render it. : Hebrew (sar) Definition: chieftain, chief, ruler, official, captain, prince. 6. No, the angels and 24 elders were not there in heaven before time and the universe were created. Only God has that distinction. Read Proverbs 8 about Wisdom/Word being created right before the universe as the craftsman through which all things were created (Col 1:16). Appreciate the article and the comments. I very much agree that these are not angels as the Bible is quite clear that the elders and the angels are distinct. However, I do disagree regarding their position as those that resurrected with Christ. Prior to the death, burial, and resurrection of Christ, we are dealing with Old Testament as the death of the testator is necessary to enter a New Testament. Jesus was sent to the children of Israel so any saints buried in Jerusalem would be (almost exclusively) of the nation Israel. Yet the 24 elders of revelation have very specific features. First, they are not Jews (exclusively) because they were redeemed from EVERY nation and tongue. They also were not Jews because Jews had to be Kings (Tribe of Judah, line of David) or Priests (Tribe of Levi, Line of Aaron) and definitely not both. The only group called King’s and Priests are those after the order of Melchizidek by Jesus Christ. These 24 elders also match the description of the “Overcomers” of the seven churches. Lastly, the number 24 MUST be representative because biblically speaking, the entire world consists of 70 nations. And these 24 come from Every one of those in Revelation 5 (every kindred, and tongue, and people, and nation;) Of course, I suppose they could be a literal 24 if you consider multinational people, but the fact remains that per the context and their description, it would seem they were representative of the raptured bride of Christ. The last thing I would mention is that prior to Revelation 4, the throne of God never has all members of the trinity present. Jesus makes it clear that He and the Holy Spirit can not, in a physical sense, both be on earth at the same time. While this is not within our understanding nor does it deal with God’s omnipresence, but from our point of view, The Holy Spirit is to forever (again from a physical perspective) stay with the Born again believers (aka the church) yet in Revelation 4, it is before the throne of God burning form the 7 candlesticks. The candlesticks in Revelation 1 are said to be the churches, and they are in heaven by Revelation 4, as are the elders. (before anyone argues about the difference between a candlestick and a lampstand, candles were not invented till over a thousand years after the New Testament). Anyways, I hope you enjoy these thoughts and encourage you to continue in your ministry and appreciate all the work you do. God bless you.